Noida-based Dhanshree and her Bengaluru-based sister run a jewellery and fabrics' business called Astitva By Rabani. Check their e-store if you spend your weekends (or tea breaks) shopping online and have a kurta-and-kohl loving side that seeks out big and bold silver trinkets. Silver jewellery, earrings, chokers, nose pins, affordable German silver pieces. The sisters either source jewellery or create the pieces themselves. 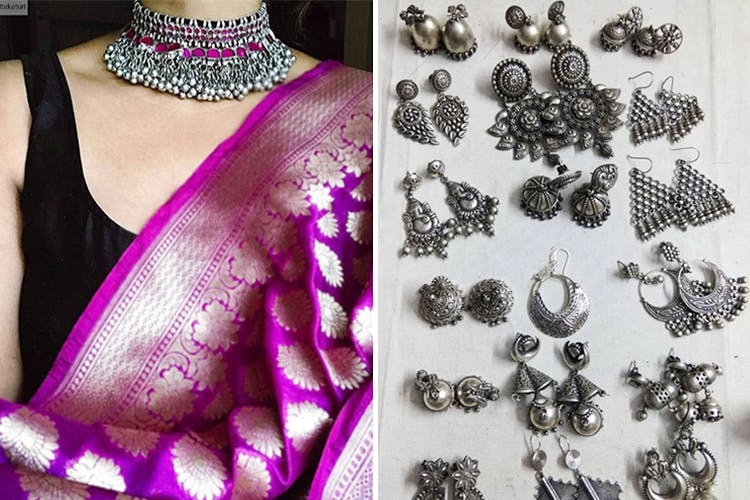 They scour undiscovered markets across Udaipur, Jaipur, Orissa and Delhi to get a wide selection of silver necklaces, chandelier earrings, hipster nose pins, chandbaalis, statement rings and more. They intend on adding fabrics including crop tops, dupattas and more pretty soon. For now, we have our heart set on their Lambini chokers that come at INR 499 and silver glass earrings that come in a myriad colours. The Astitva folks deliver across the country and if you’re iffy about making online payments (OMG credit card theft etc), they offer COD for a small, extra charge. If your order exceeds INR 1,500, they waive off the extra charge. The older posts on their Facebook page are rather badly shot. In fact, we also don’t particularly dig a lot of their years-old stock but hey, more than two decades into business, they’ve come a long way and happy testimonials from patrons and jewellery junkies are proof that they’re doing more things right. The brand’s big on combo offers, where they sell a set of nose pins or pairs of earrings at a steal. Watch their FB and Instagram page like a hawk. For now, they don't have a website, so they take orders through their social media pages.